In radiant textuality, Mcgann introduces the practice of deformance by suggesting that it will help “break beyond conceptual analysis into the kinds of knowledge involved in performative operations.” (106) As I understand him, Mcgann is reminding us that there is a kind of knowledge that cannot be “cast in thematic form.” (106) Interpretation that seeks to extract a meaning in thematic form assumes that meaning is something contained by the work of literature, let us say a poem for example, which can be sucked out and recast otherwise. There is a place for such interpretative strategies, but they tend to ignore the knowledge embedded in the textuality/materiality of the poem that is acquired not by ratiocination but by performance. This knowledge by its nature is difficult to articulate, but it is the kind of knowledge that deformance seeks to tap and the language of “intimacy” with a text gets at the sensuality of this knowledge. This knowledge arises from the forming of the words with our mouths, the seeing of the words on the printed page (a seeing that is sharpened by distortion), the hearing of sounds made by the words (again sharpened by distortion), and even feeling the weight of the book in the hand. To read the works backward or to displace or isolate elements of the text is a way of helping us see what ordinarily “escapes our scrutiny” (116) because with most interpreters we locate meaning not in the documentary features of the text but in a linguistic event. (115) Mcgann’s dedication to John Unsworth, Deo Gratias, invites me to understand this almost as a kind of liturgical knowledge. 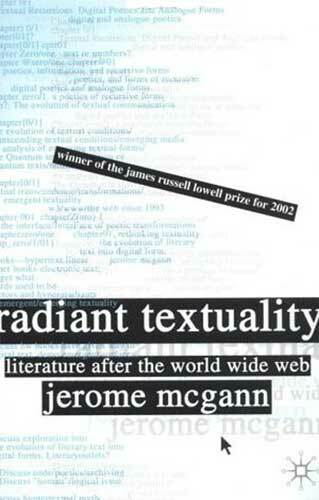 My sense is that Mcgann sees this kind of knowledge that emerges out of the work of building something like the Rossetti Archive as a critical step toward envisioning what the digital humanities can be, but that he also is concerned that digitized texts will not be able to attain the capabilities of critical interaction with the materiality of our texts. Or perhaps to put it differently, he is most concerned that forgetting what we have learned over centuries of interaction with material texts, we will fail to incorporate that knowledge into our emerging digital tools.